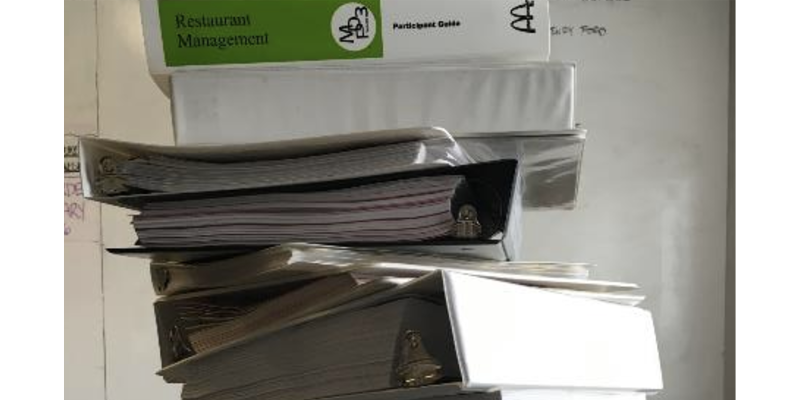 How does one of the largest restaurants in the world train and onboard its employees? In our recent Coffee Hour webinar, we got to hear first-hand from McDonald’s Director of Learning Technologies, Jack Sylvester, on how McDonald’s uses Inkling Knowledge to transform restaurant operations. Chatting with Inkling CEO Matt MacInnis, Jack enthusiastically described how Inkling has revolutionized their in-store training, helping to drive down costs – an estimated $30 Million in savings per year – and improve the employee experience. This means that McDonald’s has to take on the daunting task of training and onboarding each of these 1 million crew members every year. Before Inkling, McDonald’s adopted a variety of tactics over the years to train employees and communicate standard operating procedures to restaurant locations worldwide. This included dense, three-inch printed binders that were shipped to each store location. For training, employees would go through “digital” trainings on a desktop computer in the backroom of the restaurant. On average, each new hire would spend 12 hours in the backroom clicking through tutorials without really learning how to complete tasks, before hitting the restaurant floor to learn from peers and managers. It’s proven that employees learn best when they are out on the restaurant floor, working and learning with their colleagues by their side. With Inkling, McDonald’s enabled employees with this shoulder-to-shoulder training, reducing onboarding time by an average of 3 hours per crew member. They first rolled it out for fries and hashbrowns trainings – delicious! In addition to training, McDonald’s uses Inkling for digital reference materials and support tools that are available at employees’ fingertips for any questions they may have while on the job. The partnership with Inkling had an immediate impact on restaurant associates and managers. This isn’t to say there weren’t any challenges when implementing an enterprise digital platform across the company. In the webinar, Jack shared some of the issues they encountered and surpassed when first implementing the system, such as WiFi connectivity and change-management with franchises. Throughout the coffee hour, we were lucky to also get feedback from the audience, answering poll questions like “What’s driving investments in new technology for field employees?” Many attendees felt that employee retention and engagement were the biggest driver. To see all the poll results and hear more about how McDonald’s uses Inkling today, watch the recorded webinar by clicking here. Polina is a Senior Digital Marketing Manager at Inkling.